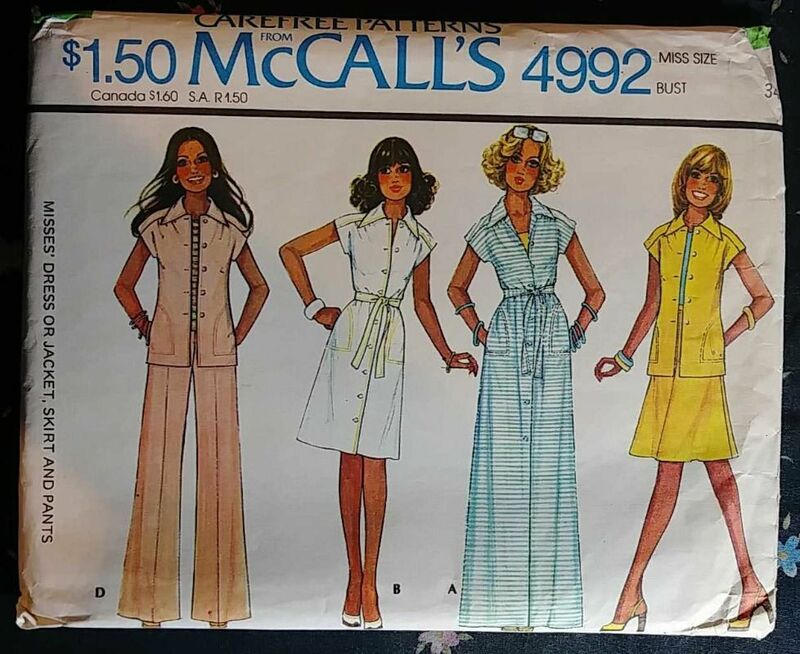 I wanted a pattern to use both of my fabric choices and reached into my vintage pattern stash and found Mccalls 4992. This maxi shirt-dress pattern with its back/shoulder yoke and waist tie was a perfect canvas for these fabrics. 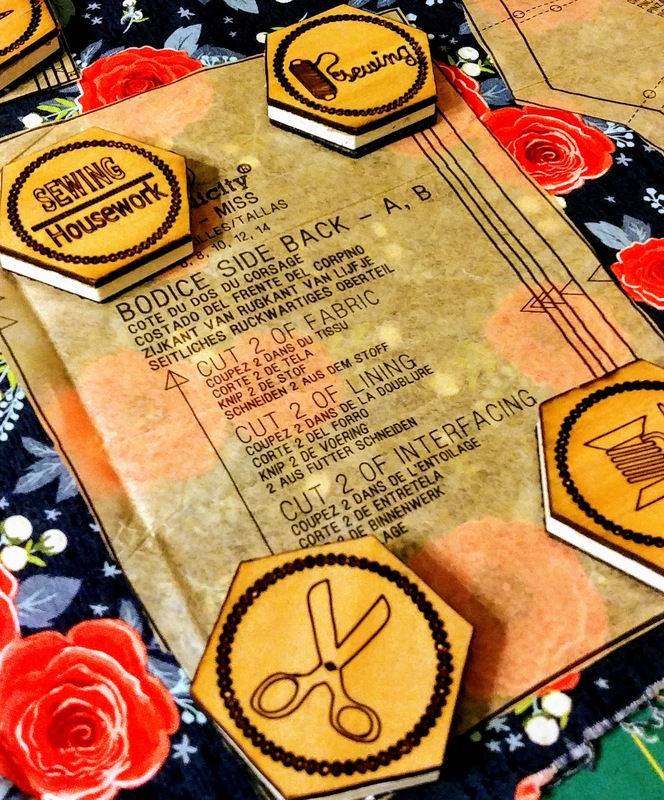 The construction was a breeze and the buttonhole anxiety was much ado about nothing! All of the buttonholes sewed effortlessly on my Bernina 535. After stitching, I added Fray Check to the front and back of the buttonhole, allowed it to dry, then cut them open with my buttonhole cutter. This gives a cleaner cut to the threads and prevents frays over time. I wanted to bring in a bit more of the contrasting fabric to the front of the dress. I used a button cover kit to make my own fabric buttons. It was a quick and easy process and a fun addition to this dress. I am working on making a wardrobe of interesting yet, everyday wearable pieces. I love that this dress can serve as a layering piece over my staple of jeans and a t-shirt. I love the ample crescent shaped side pockets that eliminates the need for a handbag for quick trips to pick the kids up from school. I added simple thread carriers to the side and center back seams. Though not functional when worn open, I like the look of the belt tied in back. The contrasting fabric balances the bold floral by adding an unexpected interest. When I need to be more than casual Mama, I love wearing it as intended buttoned-up and with its' twice wrap around belt tie. This is a slight departure from the dresses I normally make and I am liking it loads. The belt pulls in the fullness in the back for a nice silhouette. I love this dress and how I feel triumphant in finally getting past my problems with buttonholes. 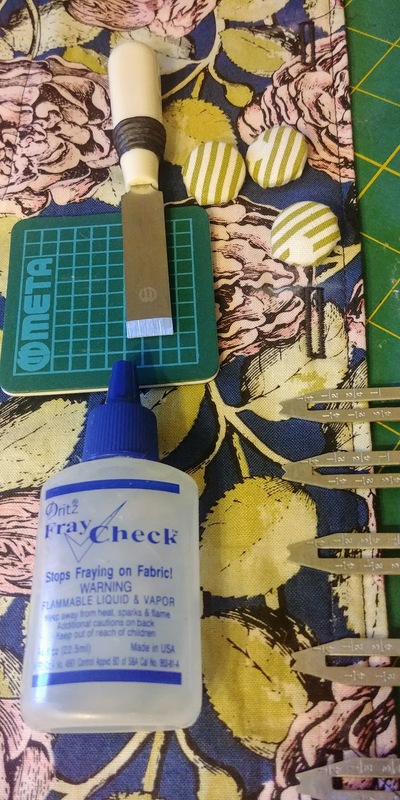 What sewing related task do you avoid because of fear or failure? It took a machine upgrade to get me through it. What do you think will get you past yours? I Will Never Tire of Twinning with My Mini-Me. Little Miss and I were sorting through her wardrobe to pack away clothes that she has out grown. I got sappy and nostalgic reminiscing about the projects she has inspired over the years. She asked what my sad face was about. I told her it was a mix of her growing up so fast and outgrowing me-made before they were worn out. She immediately reached in the storage bin, pulled out a dress and said, "What do you mean? My daughter is going to have the cutest clothes!" Proud Mama win!!!! She then went on to remind me that we have a stack of Riley Blake Fabrics, she is still growing and my hands aren't broken! In other words, get to making her more clothes! The Serenade collection will be releasing soon and I am always surprised by her choices! Her garment tastes are a blend of twirling flowy pieces with the added practicality of play. 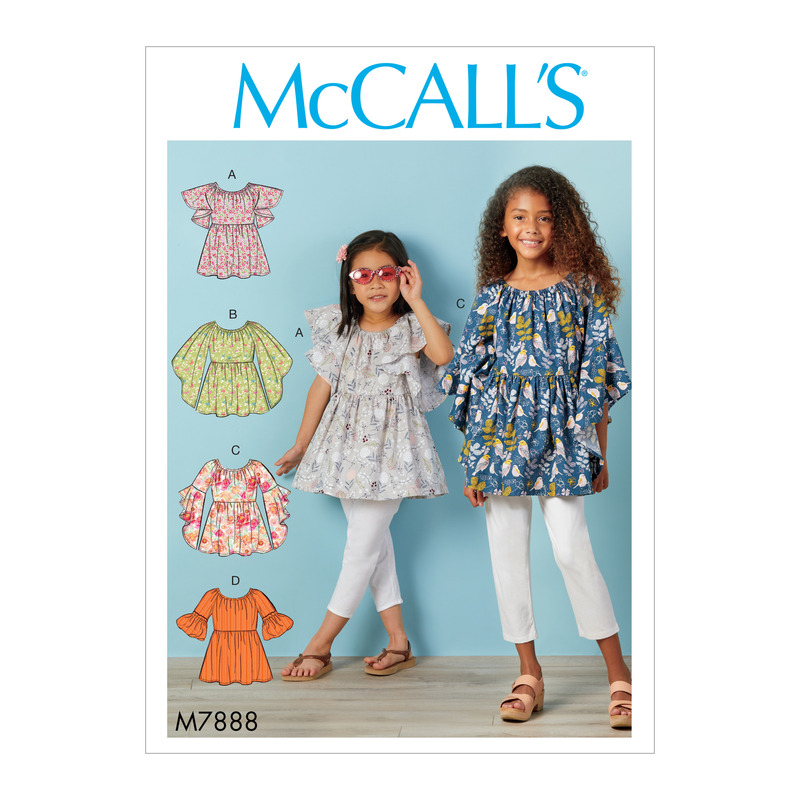 She wanted decided she wanted the tunic in Mccalls 7888 view A. She likes the style and the fact that the model looks like her was a deciding factor. Another bit of proof that representation matters! She loves the feminine fabric with the security of the elastic of the on or off the shoulder neckline. It keeps her secure with her active play. To increase longevity of wear, I went up a size to a 12 and added elastic to the back waistline seam to gather in the extra fullness. For my top, I went way back in my time machine for a pattern that I could use to mix prints. The vintage Simplicity 8587 is a simple pattern to showcase the coordinating Serenade Dot Tide print I chose. It is a fast and easy make and in line with my goal of making everyday pieces. I love that is a good stash busting pattern and how cute is that little tie? Little Miss has advised me to enjoy this shirt, wear it well and keep in mind that she gets all of my hand-me-downs! "I do want my daughter to have cute clothes, right?" A Beautiful Day in the Sun is Bliss! Will this weather make up its' mind? We go through the 4 seasons in a week on the Texas Gulf Coast. These indecisive weather changes has helped me identify holes in my wardrobe. I am in desperate need of separates, specifically tops in fun fabrics. The Bliss line by Riley Blake Designs is full of designs that foot the bill. From a few of my previous collaborations with Riley Blake Designs (Let's Be Mermaids, In Bloom ), you will remember I love the metallic fabrics they offer and I gravitate to them every time. and Bliss Black Stripes Sparkle spoke to me. I used Simplicity 8137 to make this fun peplum wrap top. It is just enough shine and sparkle to jazz up a pair of jeans. I love the fit and cut it straight from the envelope with no major adjustments. I only added a hook and eye closure to the wrap front to keep it from gaping. If I made it again, I would lengthen the peplum by about three inches. I used the black sparkle stripe to make a pair of shorts to wear with the top. I used Simplicity 1464. I have recently introduced the kids to Family Matters, we love it, but I think it subconsciously influenced my shorts choice. After I made this, I saw Laura in a very similar outfit! I couldn't believe I was channeling my '90's! I couldn't bring myself to wear it here! I think it works together, but I will likely not wear it like this. The shorts look great with a black tank top and when it warms up again, I will share that pairing. There Are No Scraps of Hedge Rose In My Sewing Studio! There are some fabrics I buy, hold onto, and treasure for years without cutting into them. I may fear ruining them, cannot decide how to use them, or want to enjoy the dreamy limbo and promise of indecision. When I saw Hedge Rose by Kelly Panacci I knew I would be propelled in the opposite direction. The direction of wanting to immediately wrap my entire body in the fabric as soon as possible! I absolutely love the roses against the rich navy in this floral design. The background texture really adds a depth to the print that I just love. 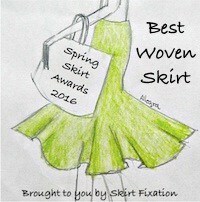 I knew I wanted to make a garment that took advantage of every available fiber! 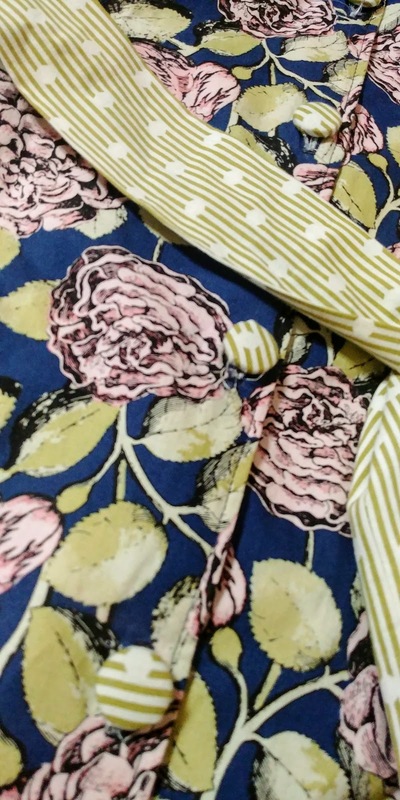 I chose to make a maxi dress using Simplicity 8635. I thought the roses were a lovely compliment to the sweetheart neckline and shoulder straps. Laser-cut pattern weights available in my Etsy Store. I had concerns about coverage and the strength of the straps for the bodice. 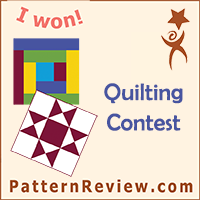 I made no adjustments to the pattern and it has me well-covered. I got dressed and took these photos alone. There is slight pooling of fabric above the waistline because I tied the dress myself. This resulted in my pulling the bodice down. When hubby helped me before, it fit perfectly without the issue. I like how the loops and tie secure the back above the invisible zipper. 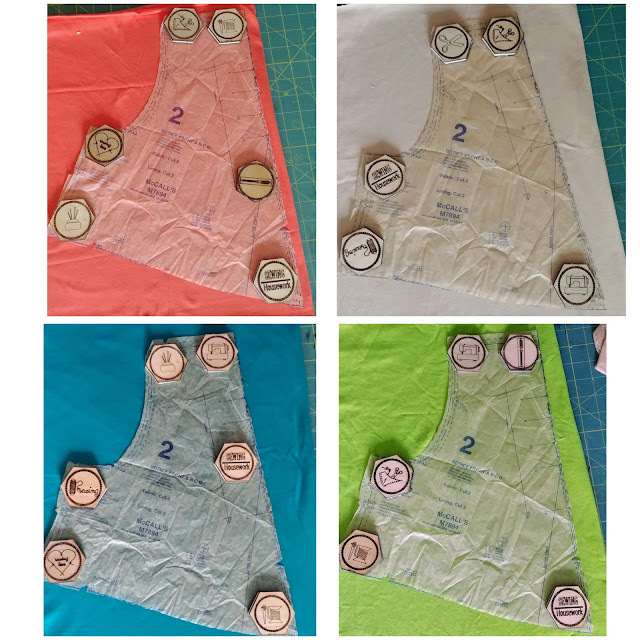 If I am going to make a lined dress in fabric I love, the only thing that makes it supreme is, pockets! I love this fabric! I love this dress! Hubby has plans for seeing it as is, on date night. I also have plans for pairing it with a leather or denim jacket for a girls night out! This fabric was released this month and should be at quilt stores if not now, soon. When you get ready to buy, be sure to get a bit more than you think you will need; you will not regret it! I have confession, I felt a bit guilty about sharing this early Spring make. I see my friends blanketed in snow, making Blackwood Cardigans and Toaster sweaters with no promise of the weather changing for the better. I wondered if it is impolite or bragging even, to bask in the sun with 60 degree temps? I considered waiting to share this until the national forecast improves. Then my brain kicked in. None of these friends were complaining about the weather! They were not sulking in their cozy beautifully made clothes! They are not policing whether (hahaha!) I, or anyone, is making seasonally appropriate clothes! I totally projected my miserable Midwestern winters onto people! I would resent happy sunshiny clothes if I were freezing, but I can be petty when I am miserable. I am trusting that you reader, are more adult than I and will enjoy this dress regardless of your temperatures. 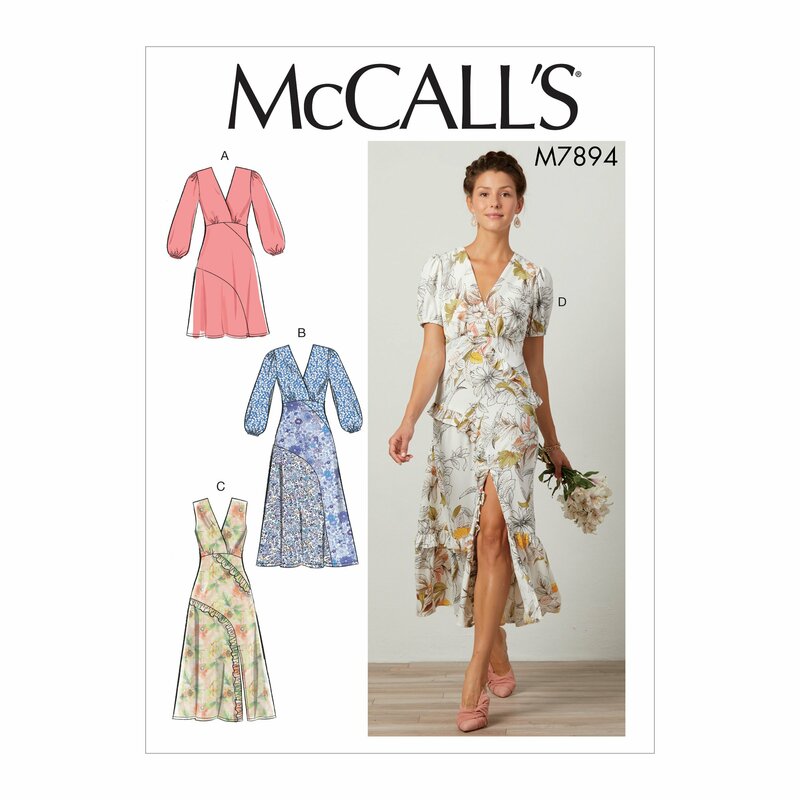 I bought the Mccalls 7894 pattern as soon as it was released! I fell in love with the seam lines and saw the potential for color-blocking and hand-sewing in organic cotton jersey. 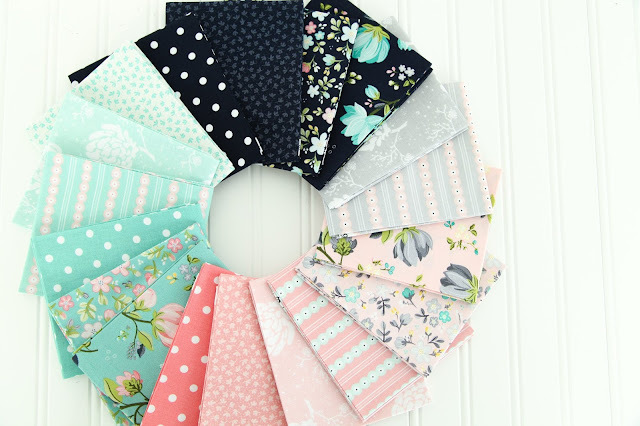 I love the wide assortment of colors of jersey available at Nature's Fabric. I am working my way toward using all of them in time. Figuring out the combination of colors to use with this dress was the hardest part. In the end, I chose Coral (1 yard), Mustard (1.5 yard), Sea Blue (1.5 yards) and Off White (.5 yard). The pattern is designed for woven fabrics and with a side invisible zipper. I wanted the style of A with the length of B. I made a few simple modifications to adjust it for sewing this jersey fabric. I sized down to account for the stretch of the fabric and body skimming, but not clinging, ease. In the interest of time, I used my serger for the internal seams reserving hand-sewing for the visible seams. I love the look of hand-sewn stitches and with this color-blocking I could not resist adding them here. I folded the seams to one side and with button and craft thread and a hand-sewing needle, stitched them down. I used a double strand of button and craft thread because of its strength and weight. I did not apply these stitches to the waistline or neckline because it would reduce the stretch. Brace yourself, I am giving you a close booty shot next. Not a normal angle for me, but the lines of the blocking work really well in the back. Because the jersey does not fray, I left it raw to curl in time. This turned out exactly as I expected. I am on the fence about how I feel about the sleeves, however. I have a baby face and I am often mistaken for much younger than I am. The gathered sleeve cap and elastic casing with these crayon colors feels a bit "sweet" to me. I may remove the casing and let them flow loosely. What do you think? This dress is very comfortable to wear, it is like wearing my favorite t-shirt with a twist. I am thrilled with this final color combination and see the potential for another, maybe in maxi length, on the horizon.